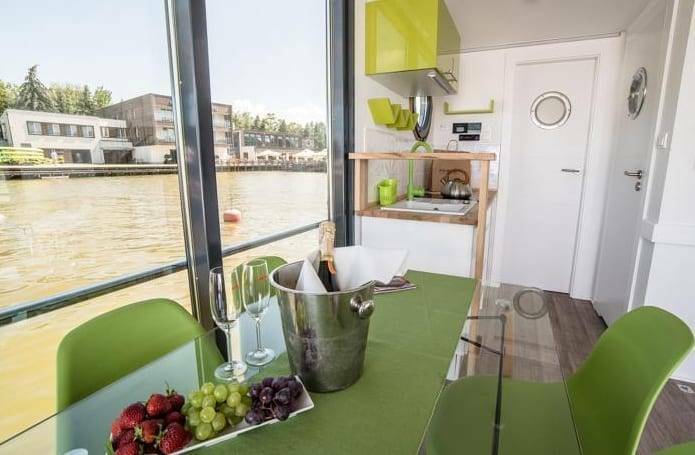 Whether you are moored safely in the harbour or on a voyage of discovery – with the Apartboat “Nordic Line” you can enjoy a wonderfully relaxed day on the water! The large glazed front provides plenty of air and light in the saloon and extends the living room to the terrace, up on the roof terrace you have a breathtaking panoramic view. 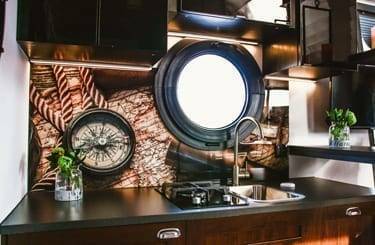 The La Mare Apartboat “Nordic Line” is so well insulated that life on the houseboat is comfortably warm and comfortable even in winter. 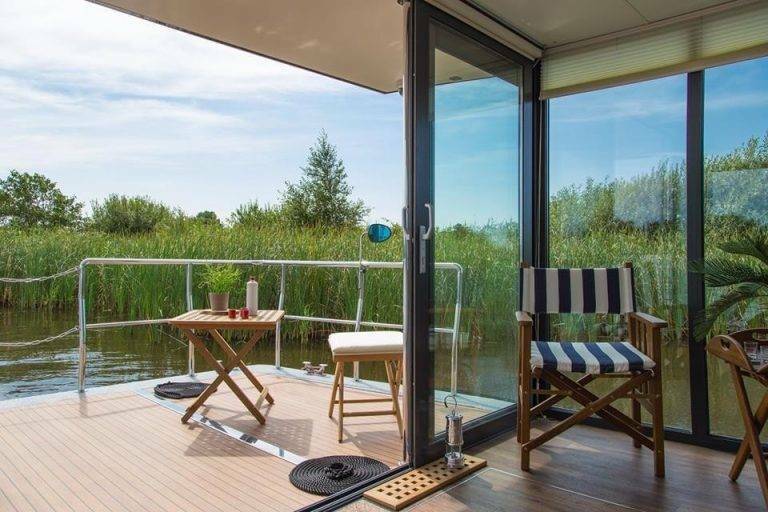 Depending on your wishes, your houseboat can be equipped with many additional options up to solar panels or an on-board sauna. Choose your La Mare Apartboat “Nordic Line” according to your needs. There are 3 basic types available, which can be individually motorised and adapted to your wishes. La Mare Apartboat Mini, size 9,00 x 3,60 m, price from 46.300 € plus VAT. La Mare Apartboat, size 10,80 x 4,2 m, price from 63.600 € plus VAT. La Mare Apartboat L (2 bedrooms), size 10,80 x 4,2 m, price from 67.200 € plus VAT. La Mare Apartboat XL, size 12 x 5,0 m, price from 81.900 € plus VAT. La Mare Apartboat Max, size 15,00 x 6,0 m, price from 122.000 € plus VAT. All houseboats are admitted as category D recreational craft. A recreational boat licence is not required in Sweden and Denmark. The LaMare houseboats can be navigated comfortably in the protected areas of the Swedish archipelago, for example, or can simply be used as a floating holiday home lying in the marina if motorised. 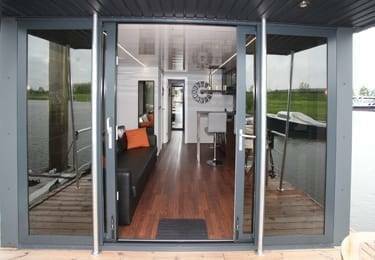 They are completely equipped in the basic version with Pantry, shower bath, toilet, heating and 230 V shore connection. The motorization and many other options are freely configurable. Skanvik is your competent La Mare service partner. Please do not hesitate to contact us, we will advise you on all questions concerning your new holiday home! 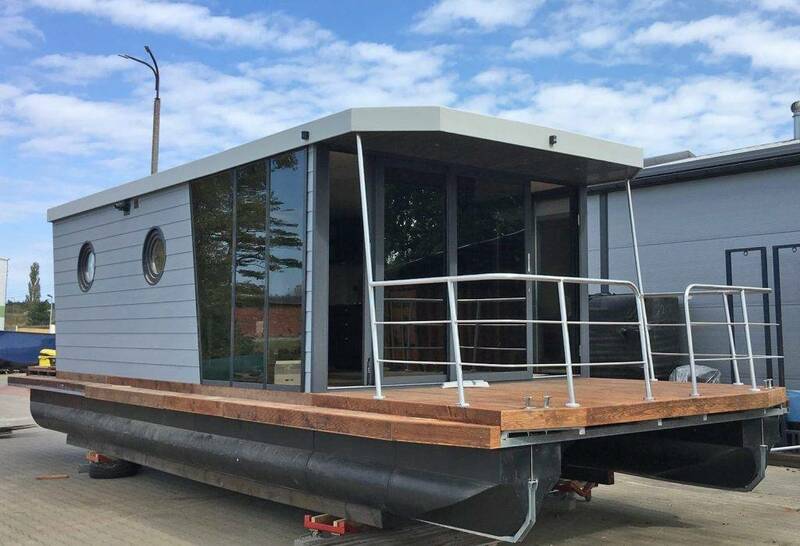 La Mare houseboats are manufactured in a solid wooden frame construction in combination with modern materials. The floats are made of very robust plastic with closed-pore foam inside, the supporting structure is made of galvanised steel. Plastic panels or wood cladding can be used for the outer wall. The La Mare Apartboat “Nordic” is easy to manoeuvre due to its light yet stable construction. It is winterproof and can remain at its berth all year round.